NEWARK, NJ­ — The New York/New Jersey Anti-Defamation League (ADL) announced that it has honored the Director of the New Jersey Office of Homeland Security and Preparedness with the 2018 ADL Making a Difference Award at its Annual New Jersey Securing Justice Awards Dinner, on Monday, December 17 in Newark. HAMILTON, NJ­ — With the holidays upon us, the New Jersey Office of Homeland Security and Preparedness (NJOHSP) would like to remind all residents and visitors throughout the State of the various resources that our Office provides to help keep you safe. 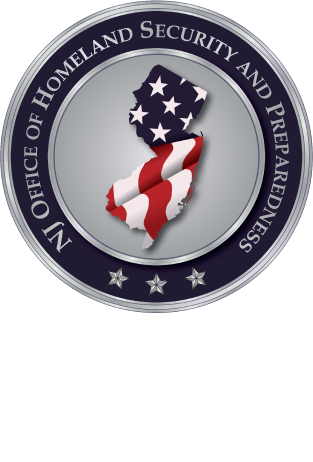 HAMILTON, NJ­­ — The New Jersey Office of Homeland Security and Preparedness (NJOHSP) is pleased to announce the effective completion of JerseyNet. JerseyNet was created as the nation’s first deployable wireless communications proof of concept for the First Responder Network Authority’s (FirstNet Authority) Nationwide Public Safety Broadband Network (NPSBN). TRENTON, NJ­ — Governor Phil Murphy signed a proclamation on September 21 declaring October as Cybersecurity Awareness Month in New Jersey. Additionally, the New Jersey Office of Homeland Security and Preparedness (NJOHSP) announced that it is participating in Cybersecurity Awareness Month and National Cybersecurity Awareness Month (NCSAM) throughout October. CAMDEN, NJ­ — On September 25-27, the New Jersey Office of Homeland Security and Preparedness (NJOHSP) piloted a three-day course from the US Department of Homeland Security (DHS) called Maritime Rad/Nuclear Detection Operations Course (PER 350) aboard the historic Battleship New Jersey in Camden County. TRENTON, NJ ­— On September 17, the New Jersey Office of Homeland Security and Preparedness (NJOHSP) announced that it has been awarded a total of $39,427,930 in federal homeland security grant funding from the US Department of Homeland Security for the prevention, protection, mitigation, response, and recovery of emerging security threats throughout the State. Jersey City, NJ – On September 8, New Jersey Office of Homeland Security and Preparedness (NJOHSP) Director Jared Maples will speak at the New Jersey 9/11 Memorial Foundation’s Empty Sky Memorial 5K Run/Walk, along with several municipal, county, State, and federal law enforcement leaders. TRENTON, N.J. — New Jersey Attorney General Gurbir S. Grewal and New Jersey Department of Education (NJDOE) Commissioner Lamont O. Repollet are calling on school communities for renewed vigilance to help ensure the safety of students and staff. TRENTON, N.J. — New Jersey has finalized a spending plan utilizing $10.2 million in federal and state election security funds. The plan will fund programs into 2023 and will address critical election infrastructure, such as cybersecurity, database improvements, and election auditing. The New Jersey Department of State, through its Division of Elections, and the New Jersey Office of Homeland Security and Preparedness, through its New Jersey Cybersecurity and Communications Integration Cell, released the following statement regarding the continued confidence in the security of the State's election systems. Director Maples Testifies Before Congressional Subcommittee on Emergency Preparedness, Response, and Communications. NEWARK, NJ — Jared Maples, Director of the New Jersey Office of Homeland Security and Preparedness (NJOHSP), spoke about New Jersey’s efforts in combatting school security during a hearing held by the US House of Representatives Subcommittee on Emergency Preparedness, Response, and Communications on July 9 at the New Jersey Institute of Technology in Newark. TRENTON, NJ – Governor Phil Murphy today announced the appointment of Christopher J. Rein as New Jersey’s Chief Technology Officer. Rein will oversee the NJ Office of Information Technology (NJOIT) and its more than 600 employees. He will be responsible for developing and implementing strategic policies, information security standards and requirements for all State departments and agencies. TRENTON, N.J. – Director Jared Maples, of the New Jersey Office of Homeland Security and Preparedness (NJOHSP), along with Attorney General Gurbir S. Grewal, announced that an Essex County man has been arrested for allegedly submitting two Uniform Commercial Code filings, which placed liens on the properties of four public officials in Irvington, N.J., totaling over $1.5 million. TRENTON, N.J. – Today, the New Jersey Office of Homeland Security and Preparedness (NJOHSP), in conjunction with the Jersey City/Newark Urban Areas Security Initiative (USAI), the New Jersey State Police, and various municipal, county, state, and federal law enforcement agencies, conducted a three-day, cross-state joint training exercise aimed at enhancing intelligence- and information-sharing between New Jersey and New York.